The Bone Wars may sound like a trashy made-for-TV movie, but in reality, it’s an essential stepping stone in the development of paleontology. 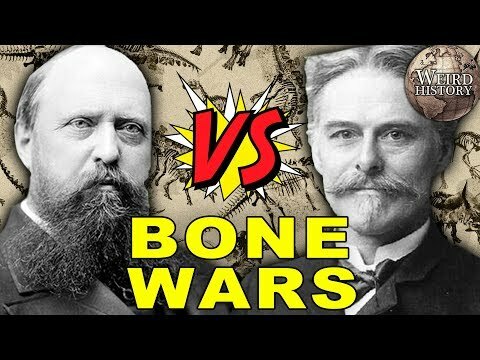 Rather than actual warfare, the Bone Wars were an intense rivalry between paleontologists Edward Drinker Cope and Othniel Charles Marsh. In a race to discover more dinosaurs than the other, Cope and Marsh turned what the world knew about dinosaurs upside down, somehow pushing paleontology forward and destroying their own reputations at the same time. Their rivalry lasted from 1864 until Cope’s death in 1897. While their paleontological rivalry did produce a number of new dinosaur species, the way they conducted themselves during the conflict left a dark stain on fossil hunting for decades thereafter. Generations later, all we’re left with is the bones, the history, and one of science's biggest feuds. The Bone Wars started in the name of discovery, but that noble purpose was eventually lost in the pursuit of competition. Edward Drinker Cope and Othniel Charles Marsh engaged in some destructive shenanigans as the contest heated up. Both Cope and Marsh were perfectly happy to dynamite dig-sites when they were finished with them rather than risk the other coming in and finding something valuable. In other words, there could be entire dinosaur species that are never discovered because these two thought their rivalry was more important than the preservation of prehistoric specimens. One of the earliest skirmishes in the Bone Wars took place in 1870, when Cope discovered and reconstructed an Elasmosaurus specimen—or so he thought. Marsh publicly ridiculed Cope after it was revealed that Cope had accidentally placed the skull of the Elasmosaurus at the end of its tail, assuming it was a giant snake-like dinosaur. Marsh wrote in a letter to The New York Herald, "When I informed Professor Cope of it his wounded vanity received a shock from which it has never recovered, and he has since been my bitter enemy." The actual discovery of this error came from another esteemed paleontologist, Joseph Leidy, who was a mentor of Cope’s. Cope attempted to buy back and destroy the scientific journals that contained his mistake, while Leidy and Marsh worked to expose him. While the Bone Wars were great for the field of paleontology in the long-term, they made a real mess of things in the short-term. In their haste to claim new species and beat the other to the prize, both Marsh and Cope engaged in some sloppy work full of errors and inaccuracies. This often led to them accidentally, or perhaps purposefully, “discovering” creatures that had already been discovered. It took paleontologists decades to sort through all their mislabeled fossils. At the end of their careers, Marsh and Cope had discovered 142 different types of dinosaur between them, but fewer than 40 of those discoveries are still considered valid today. In one infamous incident, Marsh thought he had discovered a new species that he called the Brontosaurus, but it turned out to be another example of an Apatosaurus, a species he had already discovered. This error wasn’t discovered until 1903, by which point the “Brontosaurus” had already become a well-known dinosaur. This was held up as an example of the Bone Wars gone mad. In a surprising twist, further study in 2015 of Marsh’s alleged Brontosaurus revealed significant differences between that original specimen and the Apatosaurus species, meaning that Brontosaurus did exist and Marsh had been right all along in this case. Othniel Charles Marsh and Edward Drinker Cope often worked in the field early in their careers, but the majority of the Bone Wars were conducted through proxies. Both Marsh and Cope sent agents, some of whom included their students, across America to find dig sites and procure the best fossils available. These agents were also tasked with obscuring their actions from the other side and attempting to stay one step ahead of their rivals. Marsh’s superior financial means and looser morals allowed his agents to frequently gain an edge through outright bribery, but Cope also engaged in his fair share of shady activity.